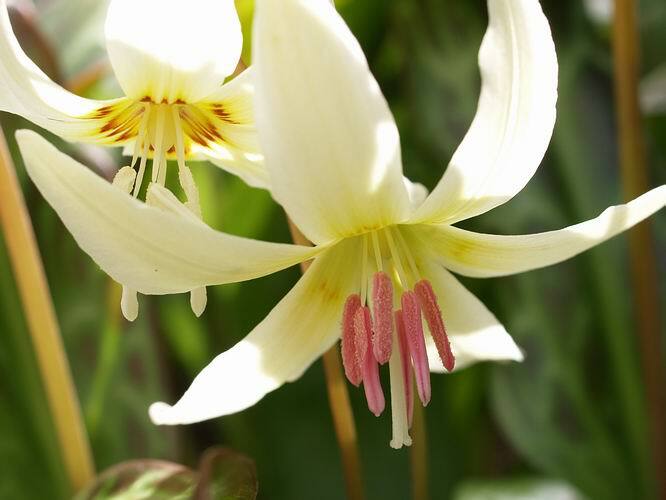 Yes it is Erythronium time again in Aberdeen as my favourite plants are just about at the peak of flowering and who could not love them. Well I hope you do as you have already had a large helping of these beauties in the bulb logs 3 to 7 when I was off gallivanting in New Zealand. 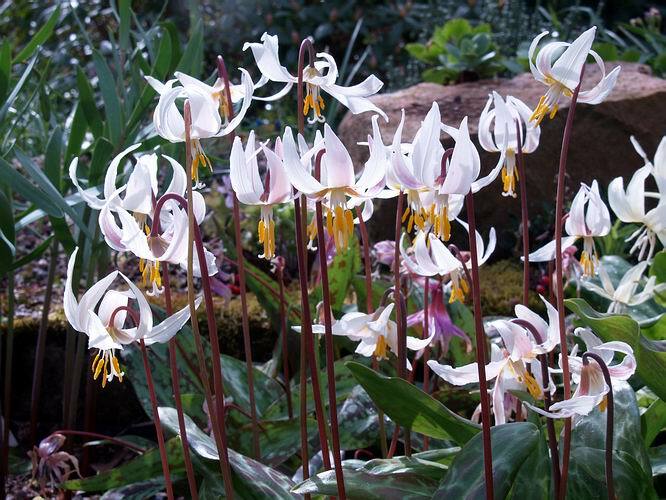 It would be instantly obvious to any one visiting our garden just now that we are fairly keen on erythroniums as they appear every where and dominate the frames as well as the garden beds. I always grow some of each type in pots or plunge baskets in the frames so that I can keep track of the different species and cultivars for propagating purposes. Re-potting every year is best but with the number bulbs we grow in pots it is often every second year before I get time to do them all- and you can notice the difference. I make a big effort to repot the very special ones every year and there is no doubt that they grow bigger, better and increase more than they do if not re-potted. 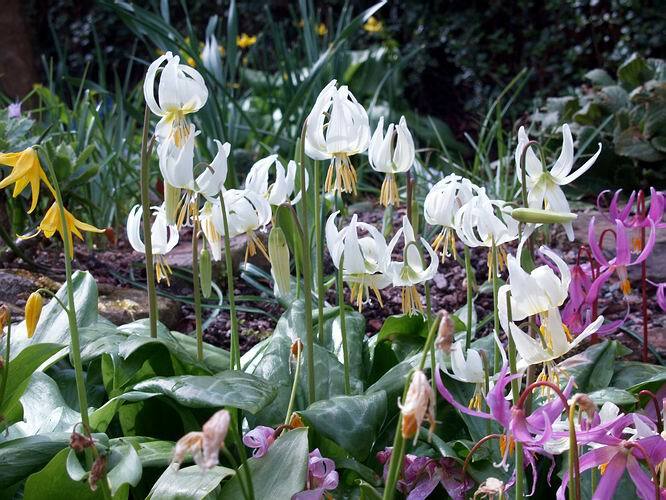 It is not quite the same story around the side of our house in the seed frames where many of these Erythronium are now flowering in their original seed pot without ever having been re-potted. I do give them supplementary feeding when they are in growth using both liquid feeds and additional potassium when they are in growth. 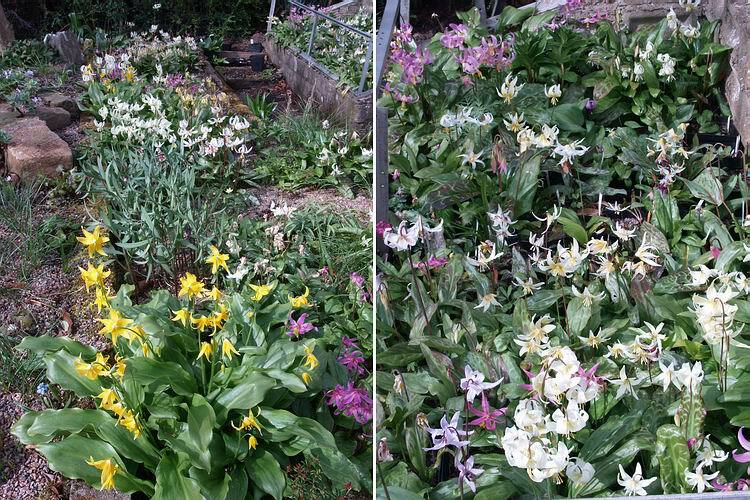 I have resolved to have a major sort out of the seed frames and release all the poor crowded mature bulbs that have spent too long in this nursery area. The knock on effect of this back log in the seed frames is that all this past year's seed pots have had to lie around on our paved areas making moving around some what hazardous. 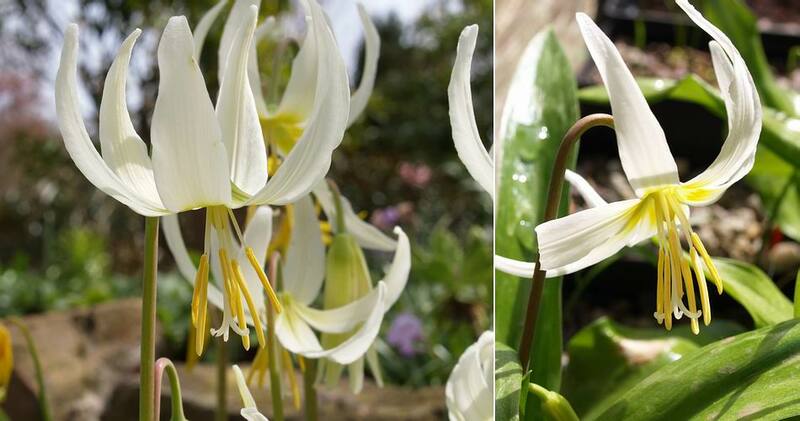 This year I have been able to confirm that the form of Erythronium revolutum with cream anthers, on the left, does come true from seed because this is a seedling. Most forms of Erythronium revolutum have golden yellow anthers as seen above right. It is also worth noticing the shape of the filaments that support the anther - they are wide at the base and taper to the end almost like Dutchman's breeches - this is a key diagnostic of this species. 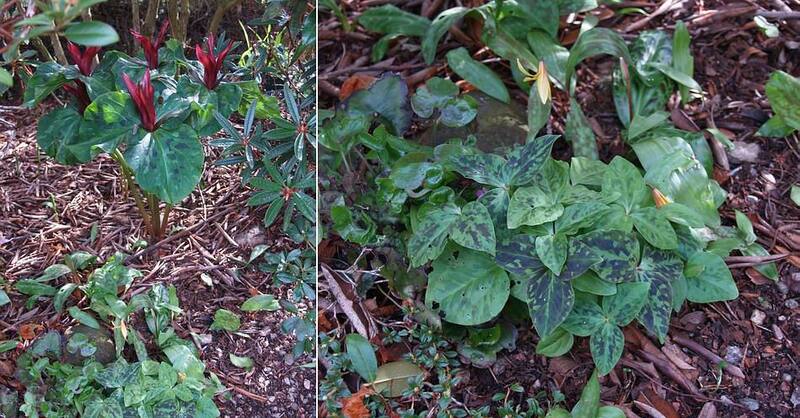 Another confirmation from the seed frames is that seedlings from Erythronium 'Mini Ha Ha' come very close to the parent as you can verify above where 'Mini Ha Ha' is on the left and the seedling on the right - although the seedling does have has narrower petals. 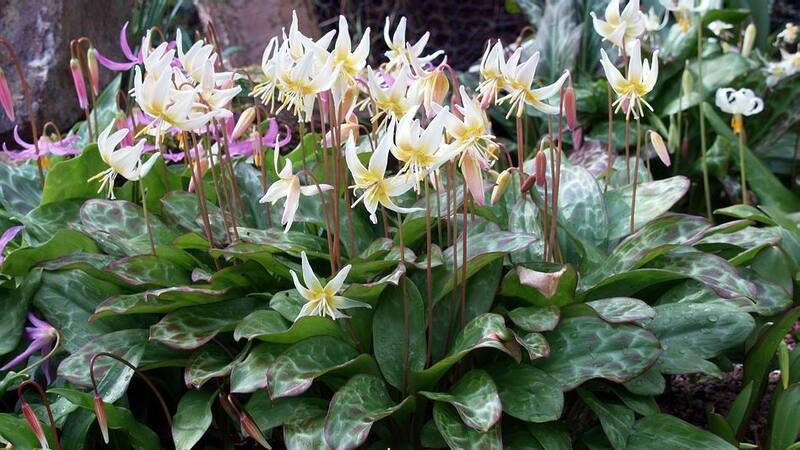 I have found that most Erythronium hybrids are fertile so they produce seed and the seedlings tend to look very similar to the parent. I am very busy going around the garden turning over every Erythronium flower looking into its face to see what looks different - no comments from you Galanthophiles please :-) Growing so many different forms and species close together it should be no surprise to find a number of hybrids as I turn the flowers over. 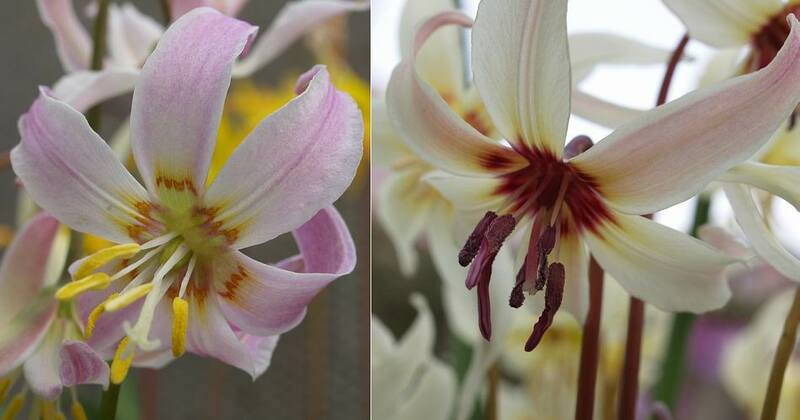 Above are a couple of open pollinated E. revolutum hybrids; I can only speculate on the pollen parent as despite my best attempts to date I have not succeeded in making an intentional cross between two erythroniums all my hybrids have been made by nature. Again look at the shape of the filaments and compare them to the true E. revolutum pictures above these hybrids have lost the distinctive Dutchman's breeches shape as do all the hybrids that I have seen. Another two spontaneous hybrids - on the left another revolutum hybrid and on the right an E. californicum hybrid with, I suspect, E. hendersonii which would account for the deep blackcurrant colour in the throat and the pollen. I have been watching this hybrid with the rose coloured anthers for a few years - it is still in a plunge basket with all its siblings and I must try and clone it out this year. There are a number of similar coloured seedlings in this basket but this is the one with the best colour. One E. helenae hybrid that I have cloned out and named is Erythronium 'Craigton Cream' it is a very good increaser with nice flowers and well marked leaves and it retains the bent style typical of E. helenae. Here is my control stock of Erythronium 'Mini Ha Ha' growing in a plunge basket. I also grow it around the garden where it increases well and it always stands out as a good plant - it should definitely be on your wants list. 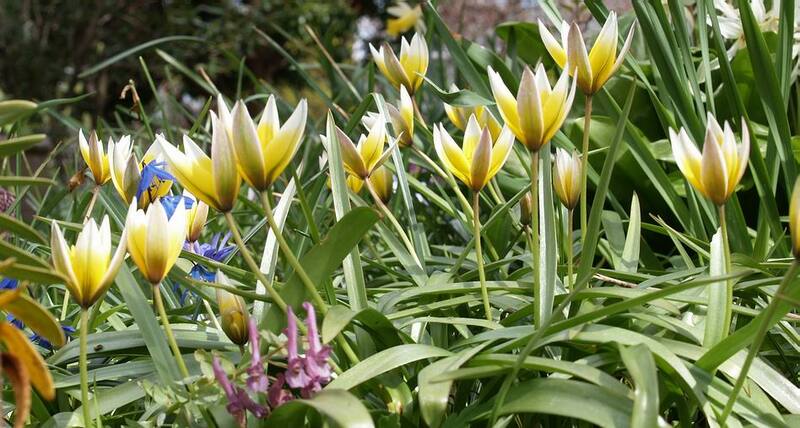 One of the forms of true Erythronium oregonum also growing in the controlled area of the plunge frames. I have yet to find a good clone of this beautiful species that will increase at any speed, my best form has just produced a third leaf this year suggesting it may have produced an off set for the first time after about 9 years. 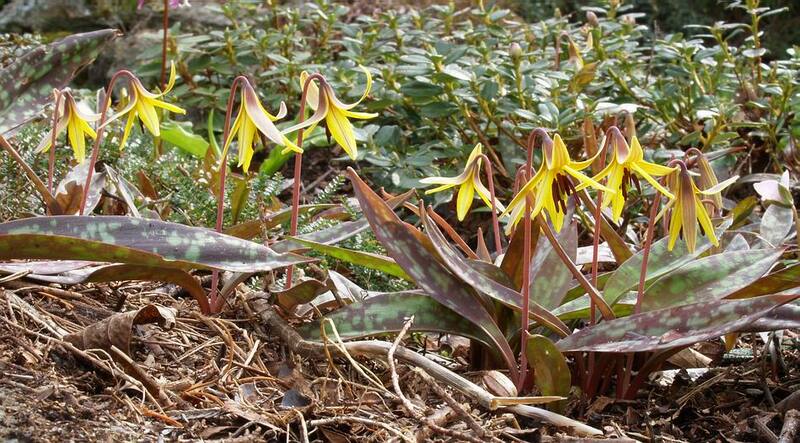 In the garden beds Erythronium 'Craigton Flower' is looking lovely, flowering freely as it does every year. This is my selected form of E. americanum but I admit that I am still confused by the 'Western Yellow' species. In the way I see them in cultivation, the taxonomy papers that I have read just do not hold up and I suspect that the three Eastern yellow species, E. americanum, umbilicatum and rostratum are, at best, well muddled up in cultivation- I will need to visit them in the wild to better understand the difference. 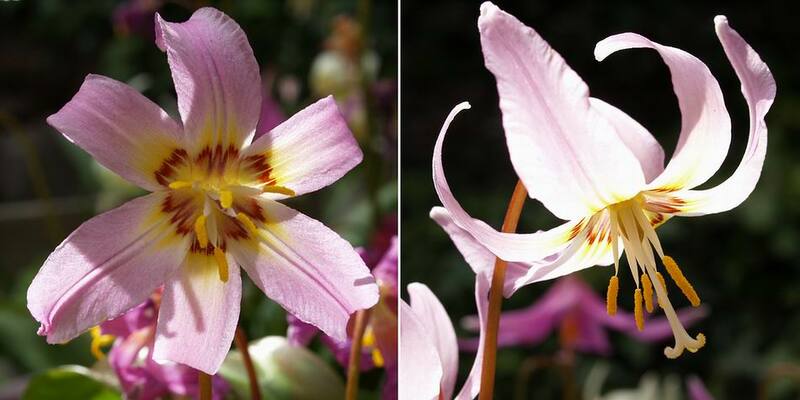 No, I have not lost my senses, this is a tulip but I just wanted you to look at and compare Erythronium with Tulips - their nearest living relative. 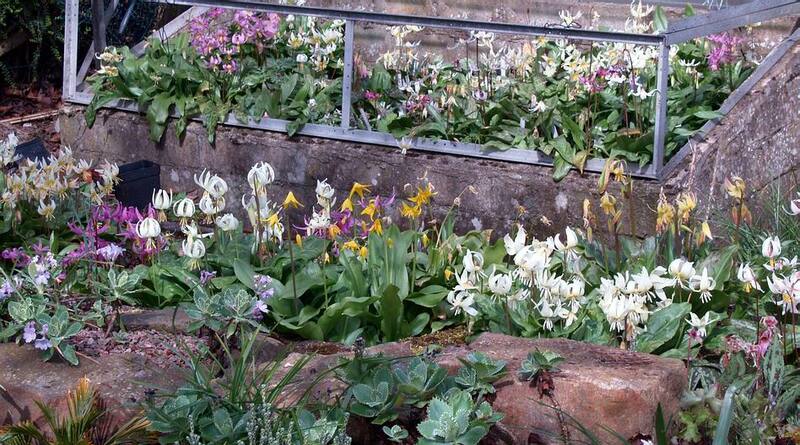 Tulips have evolved in warmer drier areas where they can afford to hold their flowers upright where erythroniums need to droop their heads to prevent rain from destroying the pollen. 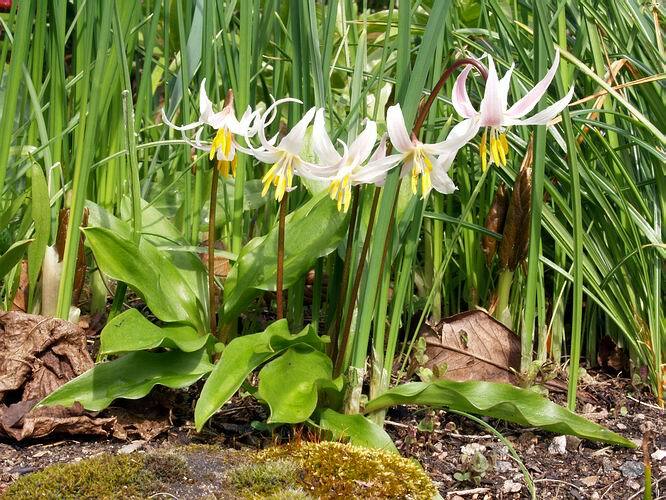 A small colony of Erythronium elegans enjoys the sunny conditions at the edge of a bed and there are a host of seedlings appearing where it has shed its seed in the gravel path. 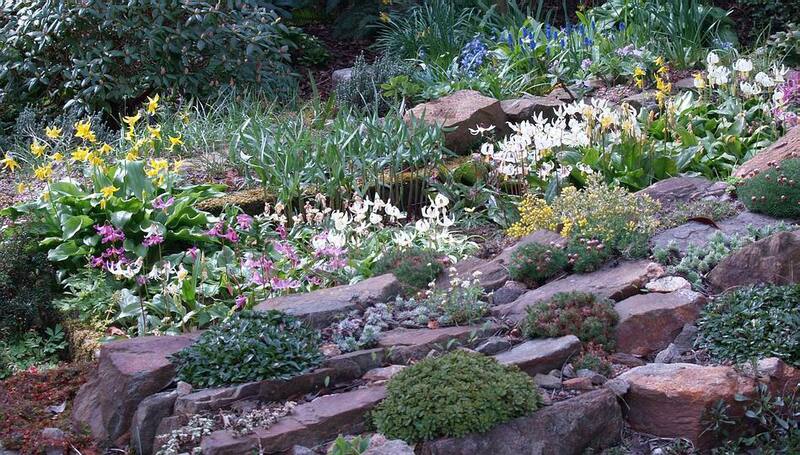 Allowing the seeds to shed naturally is my policy in the beds of erythroniums under the large Rhododendrons. There is a steady increase in the numbers appearing as each year more seeds germinate but the increase is slow when it is compared to the number of seeds that are shed and the ones that actually germinate. In my pot sown seed I expect and get a 90% germination rate but that rate drops to about 10% in these open beds. This low rate is caused by many factors including rotting of the seeds in cool damp summer conditions, foraging of the seed by birds, mice, slugs etc, and some of the seed just falls on 'stony ground'. It is not just the Erythronium that I allow to self seed - hear you can see a clump of Trillium chloropetalum seedlings growing happily at the edge of the gravel where the seed pod has fallen. In many gardens these seeds would have been grabbed by ants who would have dispersed them around as they are attracted to the sweet coating but we have no ants in our garden and wasps only seem to go for our T. ovatum seeds. I have decided that I will lift and split this group of seedlings in about a month's time to give them a better chance to grow on with out the intense competition. 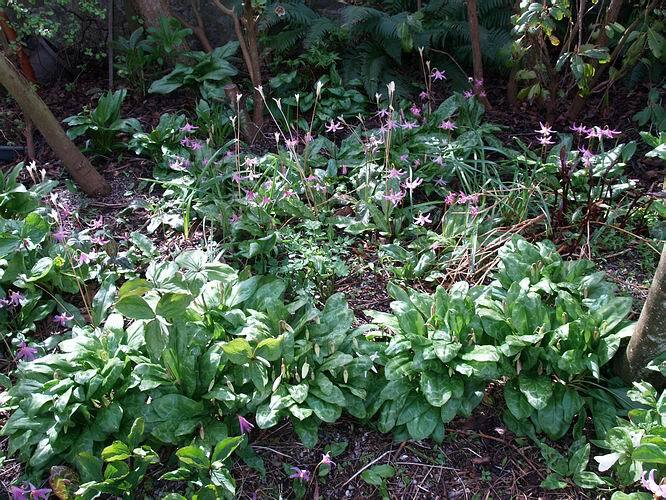 You may also have spotted some Erythronium americanum flowers in this picture - they are escapees from another bed and they are slowly making their way around the garden. 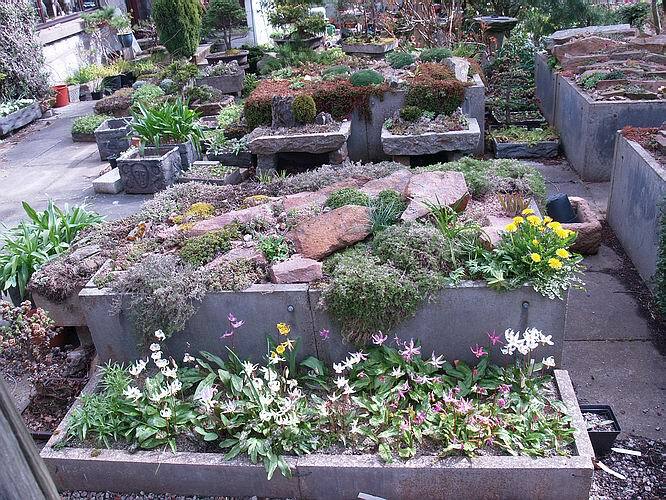 Where ever I can find the space I like to add another plunge bed for bulbs and here in the bottom of this picture you can see a nice small plunge for erythroniums tagged on to the side of a raised slab bed in our trough area - and yes, that is a dandelion. 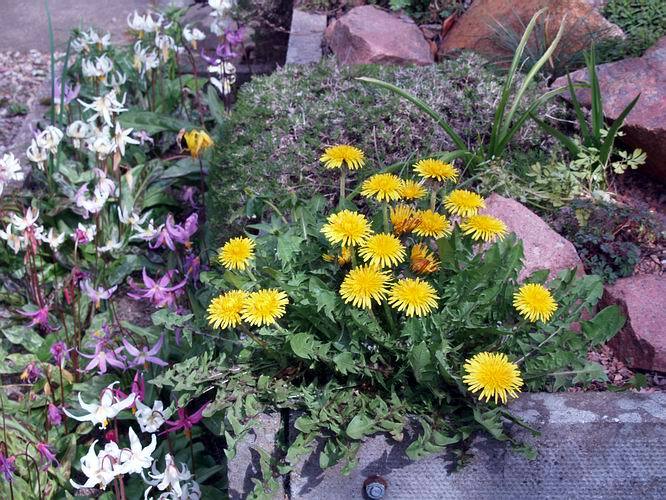 Yes it is a dandelion- Taraxicum officinalis is a beautiful plant very worthy of a place in any garden provided you are willing, by constantly taking off the dead flowers, to control its ambitions to take over the planet. Each flower lasts about a day then I just pluck it off - this prevents it setting seed and seems to encourage it to continue flowering. This has been my pet plant for many years and it always arouses a lot of attention when visitors home in on its beauty and think no it can't be a dandelion not here can it?